It's time to be honest with ourselves. Fall is here, and you need to transition from cold press to hot coffee, commando to long johns, and shandy to dark beers. 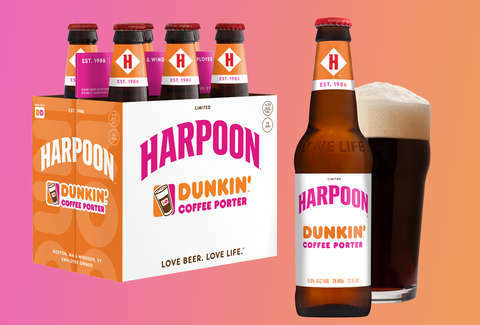 Dunkin' Donuts (soon to be just Dunkin') and Harpoon Brewery, two pillars of liquids in the great state of Massachusetts, are bringing coffee and porter together in a beer that feels like it almost makes too much sense. The limited edition beer is called Dunkin' Coffee Porter, a roasty beer with a heavy dose of Dunkin's Espresso Blend Coffee. The 6% ABV brew will be available nationwide, or, at least, in the 25 states where the employee-owned brewery distributes its beer. The dark, heavy beer pours with a thick head like crema sitting on top of an Americano. It really drives home the coffee feel in case you somehow forgot what you're drinking despite the label bearing the immediately recognizable Dunkin' font. The beer will be released on taps and in six-packs starting on October 1. This isn't the first time Dunkin' has collaborated with a brewery. It was about this time last year it worked with Catawba Brewing on its first-ever Dunkin'-branded beer, Dunkin' Punkin Brown Ale. That time, the brewery only made 20 barrels and made the beer exclusively available in its four North Carolina-based taprooms. Having Dunkin' on the label probably won't help you pass it off your afternoon coffee at work, but, you know, maybe?